I can’t say I’ve made the leap back to Arthur Conan Doyle’s celebrated detective. In recent years, I made forays into the literary detective genre, but I have done so from the comparative standpoint of contrasting American practitioners of the craft versus the British (Ian Rankin’s Detective Inspector John Rebus) and the legion of Scandinavian writers covering the beat (Camilla Läckberg, Henning Mankell and, of course, Stieg Larsson). Larsson’s a bit of a cheat, when you consider that neither his legendary heroine, Lisbeth Salander, nor her somewhat reluctant, yet idealistically-minded colleague are detectives at all. I am currently delving–completely out of sequence, mind you–into Jo Nesbø and his darkly disheveled creation, Harry Hole via “The Devil’s Star.” Nesbø has already attracted the attention of filmmakers with “Headhunters” and “Jackpot” as the premier adaptations of his work thus far. I’m quite partial to him, having favorably compared him to Elmore Leonard, my current idol in the field. The thing is, though, every detective writer out there is trying to escape the long shadow of Doyle and his Sherlock Holmes. And here I am, a film critic, a narrative detective of sorts, looking for clues while operating with a rather severe blind spot—this lack of knowledge about the great Sherlock Holmes (which is hard to believe since Holmes is everywhere). Various versions litter the small screen, and there have been more big screen takes than villains in his rogue’s gallery. But I’ve never made a concerted effort to dig into his literary origins, beyond a brief survey in junior high school, most likely “The Hound of the Baskervilles,” if I had to guess. Which is why Bill Condon’s “Mr. Holmes” feels like a blessing and a curse. Based on a novel (“A Slight Trick of the Mind”) by Mitch Cullin, the film takes and runs with Doyle’s signature character as a long-retired figure (played here by Ian McKellen), living in 1947 in a remote farmhouse with his housekeeper Mrs. Munro (Laura Linney) and her young son Roger (Milo Parker), a precocious boy with the kind of sensitive and inquisitive mind that keeps Holmes on his toes as he revisits notes on a final case that has flummoxed him for decades. He is also haunted, to a certain degree, by the impression of him that exists in the world, thanks to the series of books written by Watson (Colin Starkey). Holmes sees the notes and the resolution of this nagging mystery as his effort to write his own story at long last. Condon has surveyed various genres—adapting musicals (“Dreamgirls”) and bestselling tween fantasies (“The Twilight Saga: Breaking Dawn – Parts 1 and 2”) and horror (“Candyman: Farewell to the Flesh”)—but he has shown a keen and knowing reserve when it comes to the lives of aging reclusive men. His “Gods and Monsters” brilliantly captured the last days of James Whale (McKellen again), the director of “Frankenstein.” That film too was based on a novel (by Christopher Bram) and featured the relationship between an older figure and a young man; in “Gods and Monsters,” it was Brendan Fraser. Condon won an Academy Award for the adapted screenplay. And so, he sets his sights on similar territory, crafting, with able assistance from McKellen, a portrait of Holmes that could easily become the default representation of the character for someone like me, a crime fiction reader with precious little experience with the defining narratives. His Holmes is a welcome contrast to the morally ambiguous detectives that roam the bleak streets of the modern era. His judgment is not impaired by too much drink, the kill shots taken (or not) or the long-buried emotional traumas of his troubled youth. 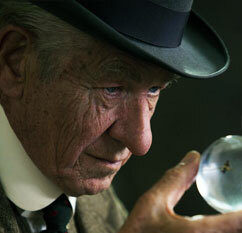 Holmes is a brilliant witness of humanity, afflicted by the simple ravages of time. His greatness is never far from the surface, but Condon’s expertly nuanced rendition is so good, it negates the need or desire for unfamiliar viewers to investigate that past for themselves. “Mr. Holmes” does indeed allow the character to write the last chapter and close the book on his own storied history.